Informal double or loose paeony-form flowers. The petals are white to cream coloured with a few rose red lines, dashed and edged bright red. Upright growth. Flowers March/April. Informal double to loose paeony form flower. White to cream with a few rose red lines, dashed and edged bright red. Upright growth. Mid season flowering. 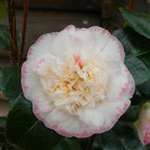 I must have searched the whole Internet for this particular Camellia in a 10ltr pot as I needed a well established shrub. Excellent and very speedy service. Very high quality plant received in peak condition. Plant was received in good time well packed and in good order was the type and size of plant I would have chosen myself from a nursery. Good addition to my collection. Plant arrived well packed and in excellent condition. Would highly recommend buying from this nursery. A good prompt service.